The instrument was previously evaluated by Campden BRI for the test of pH, bitterness, colour and alcohol and was found to give comparable results to reference methods. Campden BRI is an international reference laboratory and innovation, research and technology centre for the food and drinks industry. Five yeast slurry samples and five beer samples were analysed in triplicate for yeast vitality and VDK respectively using the CDR BeerLab® equipment and reference methods. Further more to establish repeatability of the analyses and allow calibration of the equipment, one sample each of the VDK beer and yeast sample sets was analysed in 10 replicates by the CDR BeerLab® and the Campden BRI methods. The two CDR BeerLab® analyses were calibrated using the data obtained with the reference methods. The calibrated values were compared to those from the reference methods and the precision/repeatability of the two methods was also compared. good repeatability compared to the reference method. For yeast vitality the CDR BeerLab® results were similar to those for the yeast acidification power test (APT) (correlation R2 = 0.90). Both methods were equally precise and repeatable. Comparison of the analysis results of the 5 beer samples for VDK using both, the CDR BeerLab® (calibrated values) and the reference method, showed that the results were similar (correlation R2 = 0.99). Thus the CDR BeerLab® method had good accuracy and is good for analyses requiring distillation and spectrophotometric measurement. In summary, the CDR BeerLab® yeast vitality and VDK analyses show a linear correlation with the results obtained by the reference methods and the values obtained were similar (correlation R2 ≥ 0.9). 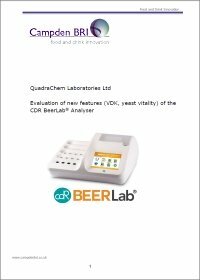 Evaluation report of new beer and wort analysis (VDK, yeast vitality) of the CDR BeerLab® Analyser was last modified: March 22nd, 2019 by CDR s.r.l.